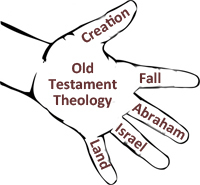 This post is meant to go “hand in hand” (pun intended) with my recent post on New Testament Theology. The two together form a cohesive way of understanding the Bible from start to finish. As I said in the first post, my particular emphasis in Biblical Scholarship is New Testament Theology through the discipline of Biblical Theology. But without a firm understanding of Old Testament theology, the New Testament simply does not make sense, and we can’t really discern what question(s) it is trying to answer, or what problem(s) it is trying to solve. That is the reason for this post. Biblical Theology: A consideration of the entire theological scope of the whole Bible (thus, “biblical”) as it unfolds naturally, over the course of time and history, piece by piece, and event by event, along the lines of its narrative flow, rather than topically, thematically, or systematically. That is, we are not dumping the text of the Bible out onto the table, then re-assembling it into an alphabetized or thematically arranged theological dictionary of theological ideas — taken out of their context, and re-assembled by topic. Rather, we are asking, “Where does it begin, how does it unfold over time, and where is it going?” To be sure, there are books called “Topical Analysis of the Bible,” and innumerable Bible dictionaries and “systematic theologies,” but the Bible is neither a topical nor an alphabetically (or systematically) arranged theology book. It is something else! Another way of explaining Biblical theology is the use of the word, “Story.” We don’t mean story the way people say fairy tales, fables, and myths etc. Rather, we mean the true story of the whole world as it is presented in the pages (the story) of Scripture. With this in mind, we will look at five primary facets of the Old Testament as a way of putting the entire story together in an inter-related way. These, as I hope to show, will reach toward the New Testament like the folding of two hands, and together, will form a coherent theological structure that helps the reader to grasp the entire message of the Bible from the beginning, to the middle, to the end. Of course, you may feel that I have left things out, but hopefully, if you take the time to think about it, you may find that your categories actually fit nicely as sub-categories under the five I will present here. Creation: God begins his heaven/earth project. Fall: God’s image-bearing representatives fail in their vocation. Abraham: God elects a man (and his descendants) to continue his original intentions for the world. Israel: From Abraham’s offspring, a nation emerges, and is set apart to bless all the nations. Land: A home and headquarters is given to God’s people for the world-blessing project. The Bible’s story begins in Genesis 1 & 2 with a heaven-earth creation. Time, space, and matter share an overlapping conjunction with immaterial, spiritual, and heavenly realities. In the center of creation, God installs an image-bearing couple who, through their own children, and through their God-honoring dominion, will rule creation as vice-regents on God’s behalf. God gives this couple the gift of land, and from their home, they and their offspring will eventually cover the earth with God’s blessing and reign. Through them, the whole creation will be blessed. Thus, God reveals his intentions for this creation from the very beginning. The creation is very good, but within the human race, that goodness is yet unconfirmed. Only through an appropriate God-honoring response to contradicting powers, ideas, and choices will their goodness find confirmation, and their vocation ultimate fulfillment. The story of Scripture moves forward in Genesis 3. Here, the image-bearing couple is faced with an opportunity to actively and substantively confirm their prior proclaimed goodness by (1) serving only God and God’s purposes, (2) rejecting the temptation to put God to the test, and (3) refusing to live by food alone, but also by every word that proceeds from God’s own mouth. In this they fail, and make a decision to instead collaborate with subversive and anti-God powers. In doing this they relinquish and abdicate their royal rule over creation, and submit themselves to a fallen messenger. The tree of life that was able to renew them is closed to them, and they are ushered out of their place of communion with God and their vocation. Access to the life they once enjoyed is sealed and closed to them, and they enter into a long process of deterioration and eventual death. But even in all this, God’s purpose to establish a very good creation, ruled by an image-bearing vice-regent whose goodness is confirmed by his own obedience in the face of evil remains intact. God promises that another will come to undo what the first couple has done. At some point, God promises, Adam will be “Un-Adamed,” and the serpent who deceived him will ultimately be crushed. It is clear from God’s promise in Gen. 3:15 that his design is to have a people who bear his image, and who rule on his behalf in the world that he has created. But the first man, Adam, taken from the dust, cut off from the tree of life in his choice to be autonomous, and to decide for himself what was good, and what was evil, lives his days in toil, and ultimately returns to the dust — his original goodness marred by sin. In Genesis 4 – 11, the primeval history continues with dramatic episodes of human failure, depravity, pride, and ultimately, the loss of all but eight people who are spared as a remnant of the human race, and who are set apart by God to move his world-blessing project forward once again. And once again, they are given the familiar charge to take land, and to multiply, and to subdue creation on God’s terms (cf. Gen. 9:1). Noah and his three sons, and their wives, along with a remnant of the animals, forge the beginnings of a new creation. Out of Noah’s sons, Shem (from which we get “Semite”) has a descendant named Abram (who is later called Abraham). Abram is elected by God in Gen. 12:1-3 to be the father of a new line of people who will be multiplied by God himself (cf. Gen. 15:5), and who will extend God’s blessing to all the nations of the earth. Abraham’s son Isaac, and Isaac’s son, Jacob are chosen by God to move the “bless the whole world” project forward still. Jacob’s twelve sons become a great family and an emerging nation, and a people for God’s own purposes is born. God’s reiterates his purposes to them with each passing generation (cf. Gen. 12:2, 15:5, 26:3-5, 28:13-15). Israel is to become the people who show the world that there is only one God, and to show them what that one God is like through their lives and witness, and to be agent through which God re-gathers the nations back into relationship with him. Israel is set apart to be God’s missionary people (cf. Gen. 18:18, Deut. 28:1, Is. 43:10). God promises Abraham a home and a headquarters where God’s people will live in covenant with him, and through their obedience to God, will witness to the surrounding nations. Land is the fourth-most repeated substantive (noun) in the entire Old Testament. It is integral to everything God does in the Old Testament. He creates land (Genesis 1:9-10), he gives land to everyone he calls to fulfill his purposes (Gen. 1:26-30, 9:1-2, 12:1, 15:18-21). In the land and from the land, God expects his people to do justice, love mercy, and walk humbly with God (cf. Micah 6:8). He gives them a home and he gives them a vocation. Nearly the entire Old Testament narrative from Genesis 12 forward is an unfolding drama of Abraham, Isaac, and Jacob’s journey toward their promised inheritance through their offspring. Yahweh, Israel, and the Land — and the dynamic relationship between these three mega-themes is the backdrop behind the entire Old Testament story. The story aches for resolution. The narrative cries out for a faithful Israel to take up the vocation to make God’s name known to the nations. The drama ends with a vocation unfulfilled, and a land only partially possessed, and a people never quite consistently faithful to Yahweh and his purposes. It is with this tension that the New Testament evangelists Matthew and Luke begin by tracing Jesus’ lineage back to Abraham (cf. Matthew 1:1-17) and Adam (cf. Luke 3:23-28), and Mark and John announce that the Son of God has come (cf. Mk. 1:1), and in him, God is with his people, and God’s people are with their God. He is the faithful God, and the faithful Israel. (cf. Jn. 1:9-14). To the first man made in God’s image, the heavens are closed and God is not pleased. His goodness is unconfirmed because of his disobedience. At his death, he stays in the grave un-vindicated, and unable to rule the creation (cf. Gen. 3:24, 5:5). But to the second man who is the image of the invisible God (cf. Col. 1:15), God re-opens the heavenly places, and pronounces that he is pleased with his son (cf. Mk. 1:9-11). The second Adam lives in the land faithfully, shows himself a faithful witness to the Gentiles, and even in his death, remains true to God. His faithfulness is vindicated by God himself, through resurrection, and he is set over the entire creation to rule and reign over it forever (cf. Mat. 28:18). In him, the once-joined heaven-and-earth creation will be re-joined, re-paired, and restored (cf. Eph. 1:10). The Old Testament begins with a good creation and a human failure. The New Testament begins with the announcement of a pleasing son and ends with the promise (and on-going project) of a New Creation — beginning with those who embrace Jesus as Earth’s rightful king, and ending with the cosmos itself coming into an eternal state of complete renewal (cf. 2 Cor. 5:17, and Rev. 21:1-2). and earn additional cash every day. There is awesome landing pages tool.